Okay, folks! This is it. We begin our final week in the BB18 house with a recap of the season, which I will not recap because I’ve already recapped this season of Big Brother via my blogs. Seems kinda redundant to recap a recap of the season so I’m not writing about the Friday, September 16th episode. We begin the actual finale episode with the first round of the Final HoH comp and it’s HILARIOUS! Paul, Nicole, and James are dressed up like cats and they have to follow a laser pointer light around the backyard to three different stations. At the big couch, they must stand on and hold onto buttons; at the kitty litter station they have to hang onto big scratching posts, and at the milk station they must stand on a tiny platform and hold onto the window blind cords – it’s a tiny wall comp! Tiny wall! Tiny wall! After an hour and seven minutes of following the pointer around, our Final Three end up on the tiny wall and everyone is slipping off the platform and swinging back to get their feet back on it, but Nicole, after an hour and 12 minutes, slips and lets go of her cord and James falls immediately after. This has Nicole a little suspicious, buuut James really did want to win it; this is one comp he was NOT going to throw. Now it’s time for part two and omg this is a ridiculous comp, but very cool. It’s a rollercoaster ride, but you have to turn through a ridiculously long line then arrange photos of three house guests in a little car to answer three questions. Once they arrange the photos, they have to push the car down the track and take a picture of HGs in the car. They have to answer the question right AND frame the picture to include the yellow bars at the front and back of the car and run back through the line to see if they’ve done it correctly. If they answer wrong and/or don’t get the car framed correctly, they have to do all that running again. Of course, both James and Nicole have some framing issues, but they quickly get the timing down and it’s all up to how they answer the questions. James finishes in 19 minutes and six seconds; Nicole says good job, then Paul reveals HER time: seven minutes and 24 seconds. So Paul is really happy about this outcome. He doesn’t think James deserves to be in the Final Two, but he’s made Final Two deals with both him and Nicole aaand he thinks it doesn’t matter who he takes because he thinks he can beat them both… Next up, Dr. Will talks to the Jury, but first, he brings out the last Jury member. A bunch of people would love to see Nicole, Michelle thinks it will be Corey and she’s right. Corey does a quick recap of his eviction then the Jury begins to debate the merits of the Final Three. Michelle gets emotional during the Nicole discussion because she’s so anti-Nicole and is adamant that Nicole evicting her was a personal move, not a strategic move; Corey and Victor assure her that it wasn’t then I guess everyone was staring at her waiting for a response and… She thinks Corey is laughing at her, but he’s not and thank you, Dr. Will, for reeling everything back in to the point. At this point, though, no one knows who the Final Two will be, they can find reasons to vote and not to vote for everyone in the Final Three and everything is up in the air. Time for the part three of the Final HoH competition and it puts Nicole and Paul upon the scales, which seems to be the norm now for the Final round of the last HoH on BB because they’ve used the scales since BB15. Question One: They both get it right. Questions Two and Three: They both get it wrong. Question Four: Paul tips the scales in his favor by getting it right while Nicole answers incorrectly. Question Five: They both get it wrong so Paul is still in the lead. Question Six: Paul tips the scales even MORE in his favor because he’s right and Nicole is wrong. Question Seven: Nicole gets it right; Paul gets it wrong. Question Eight: Both get it right, but it doesn’t matter because it means Paul wins Final HoH by ONE point! So now Paul has a half a million-dollar decision to make – WHO will he take with him to the Final Two??? We find out very quickly – He evicts James and his reasoning is that James didn’t prove his loyalty to him as much as Nicole did. In Julie’s interview we receive more enlightenment about this decision. James told Nicole he would definitely appreciate being taken to the Final Two by her if she won sooo… I don’t really see how this isn’t loyalty to Paul, but whatever. After the interview, Julie brings out the Jury, then she brings out James, and then we get to the business of these questions, which are typical for the most part. Why do you deserve it over the other person, what was your big move, etc. Paul, I gotta say, does not do a very good job of answering people’s questions; however, he does give his answers with the confidence we all expect of him. I just get the vibe that the Jury isn’t really feeling very satisfied with his answers. Nicole, on the other hand, does a great job – she does such a great job that she’s got Da’Vonne nodding her head and Da’ has been ALL about seeing Nicole walk into the Jury house. After questions, it’s speech time and this is where I thought Paul totally had this in the bag. His speech is good, he’s himself, he outlines everything he accomplished in the game and how hard he had to fight to stay in the house – even Nicole thinks his speech is good. When it’s Nicole’s turn to address the Jury, she does an equally good job of it and I think it’s her speech that really pulls her game together for the Jury. Once the speeches are over, the Jury votes in the typical fashion then we go to commercial. When we get back to the show, Glenn, Frank, Tiffany, Bronte, and Jozea have taken their seats on the stage, but do they get to talk? Nooope! What’s that all about? 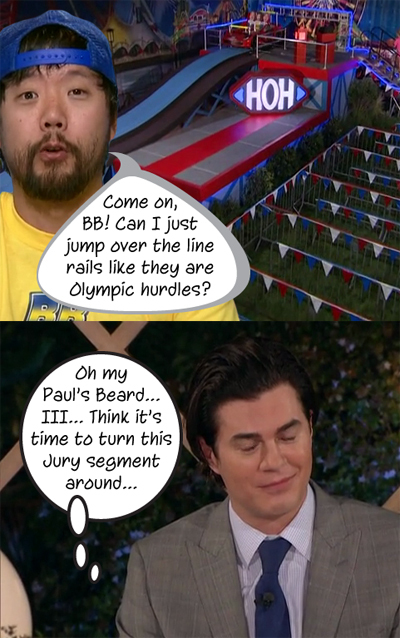 What happened to the quick segment in which all the non-Jury people get a chance to speak about the game again? Instead, we get right to the vote reading, which is as follows: James – Paul, Corey – Nicole, Victor – Paul, Natalie – Nicole, Michelle – Paul, Paulie – Nicole, Bridgette – Paul, Zakiyah – Nicole, so it all comes down to Da’Vonne’s vote… And she votes for NICOLE?! Whaaat??? I don’t think anyone saw that coming… So Nicole wins BB18 and is also the first woman to win against a man in the Final Two. Good for her. And Victor wins America’s Favorite Player. Good for him! Next Article #BBOTT Meet Your New Big Brother Cast!